I originally wrote this, in it’s non-electronic format, from inside my tent at a small campsite near Herbrandston, overlooking the Milford Haven waterway. There was only one other camper on site, with an equally small tent, and I think they were already a asleep by the time I pitched up. During the course of writing up the day’s events I managed to consume a whole packet of ginger nuts. I think I was becoming addicted to these simple yet scrumptious biscuits. Scrumptious is another word that should be used more often. Two months into the tour and 3,951 miles done to date, with at least another 1,000 left to go before I was back to Norwich, although I reckoned it would be more like 1,500 by the time I was all done. If I averaged around 70 miles a day I’d make it to Latitude fine, but that depended on the weather, the hills, and whether anything went awry during the final month of Bike around Britain. Today was a much better day than the two or three previous. For a start the sun came out properly, and I also finally got to turn east, albeit only for a little while. I woke up a bit later than normal due to my late finish the previous evening, and got the normal morning routine done and dusted quickly, keen to get back on the road. The owner and his son came over for a quick chat, interested in where I was heading today. I told them Milford Haven. They just laughed, perhaps they knew something I didn’t. I imagine their knowledge probably involved hills. I also said hello to the friendly farm dog, a golden retriever. I wouldn’t say golden retrievers are the top of the pile when it comes to intelligence, but they’re very friendly, and I was suitably slobbered on. I was packed up and on the road by 10.15, although I still wasn’t entirely sure where I was. 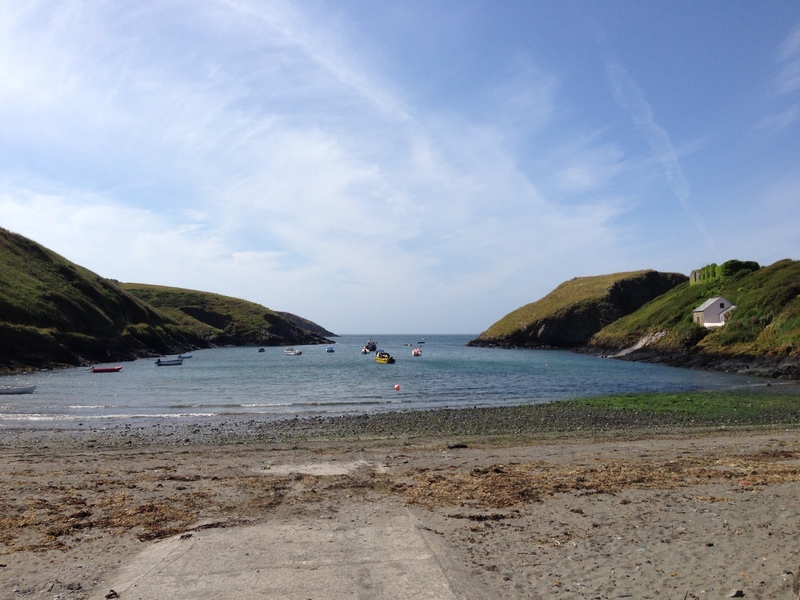 I cycled south west and discovered Penbryn village about half a mile away, good stuff, I was in roughly the right place, or roughly where I thought I was anyway. Knowing roughly where I was didn’t particularly help when it came to navigating my way through the mass of small country roads to Cardigan. There were definitely more than were on my map, which had lost its accuracy since entering this part of Wales. I eventually hit the A487 and stayed on it to Cardigan, passing a cycle tourer going the other way complete with flowing beard. 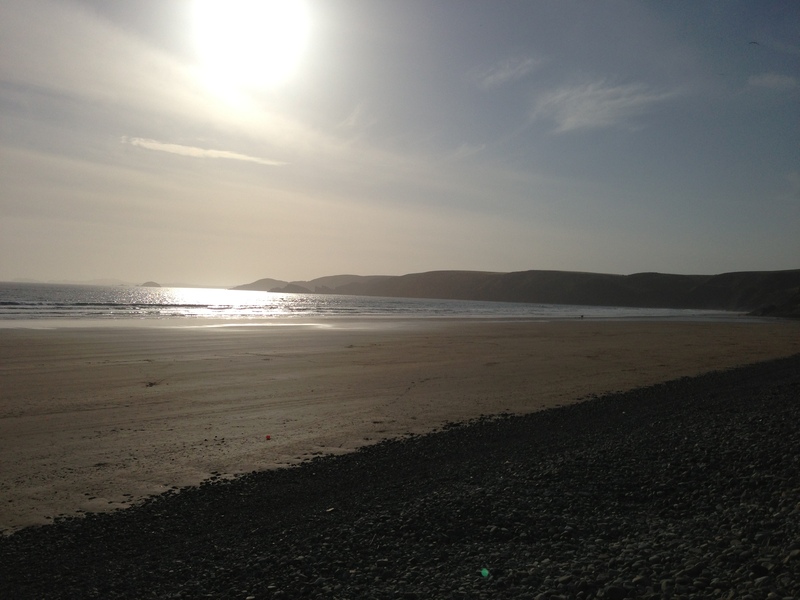 He looked like he’d been on the road for some time, having that weather stained and slightly mad look about him that I was beginning to recognise in myself; waves and smiles were duly exchanged. I stopped for a break in Cardigan and decided it was second breakfast time, finding a promising looking cafe. Full English, or Welsh, consumed, the day was definitely off to a better start, and it was only a fiver for that and a decaf coffee. Breakfast done I rode over the Afon Teifi and turned on to the B4546 towards Poppit Sands following the river back to the coast. From St Dogmaels it started to get seriously hilly again, however the sun came out and stayed out, which gave me a much needed boost up some of the climbs. 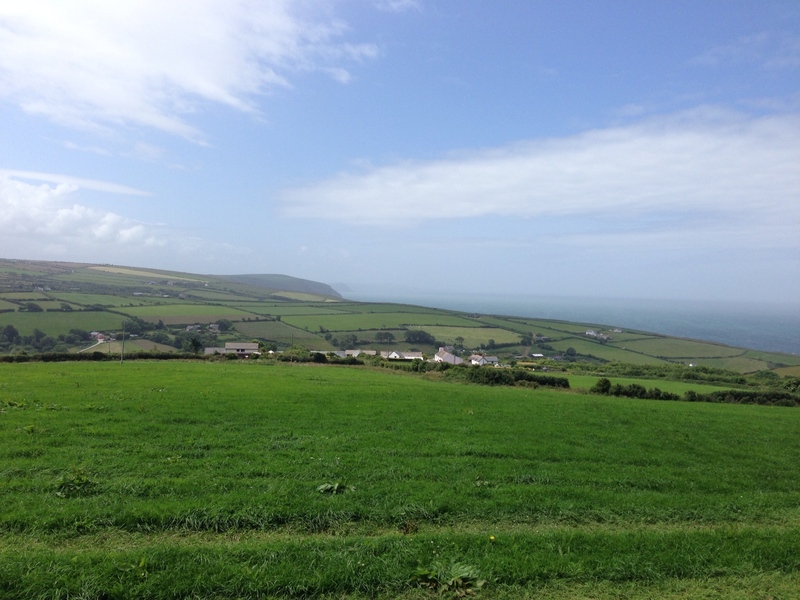 On my way to Moylgrove I stopped for 20 minutes at a picnic table above the village, and lay down in the sunshine. It was lovely just to stop and relax, taking some time out from pedalling up and down hills, not to mention the south westerly wind which couldn’t get at me in this sheltered spot. I could have very easily dozed off for an hour or two in the grass, with bees buzzing around me and a real sense that summer was definitely here. There’s a spot near Moylgrove called the Liar’s Circle, where traditionally folk apparently gathered to tell tales. 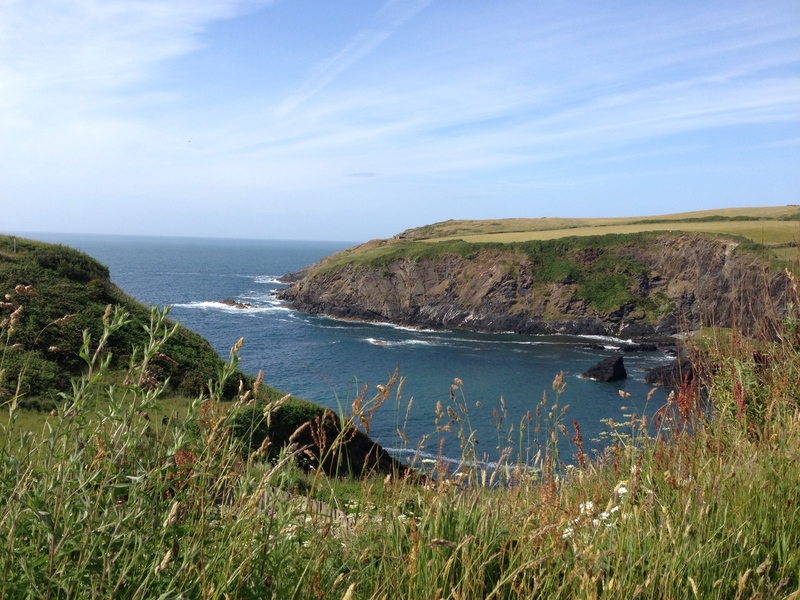 There’s also the Witches Cauldron, a famous natural rock bowl on the coast fed by the tide rushing through an underground passage, and lots of Iron Age forts, so plenty to see. Good fishing around here too, and there used to be quite a bit of smuggling which no doubt supplemented incomes. 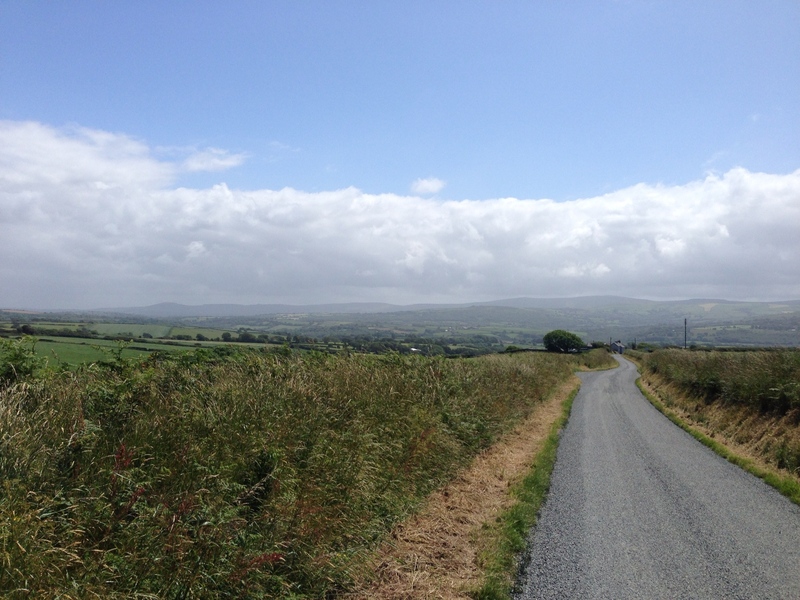 Before I completely nodded off I got back on my bike, and set off to Newport, tackling plenty more hills. The trouble with sticking to the coast road is that it goes up and down to every cove, whilst the main road a few miles inland is a lot flatter. It was however good practice for Devon and Cornwall, both of which I’d been slightly dreading due to their renowned and unforgiving gradients. The scenery was also fantastic thanks to the sunshine. 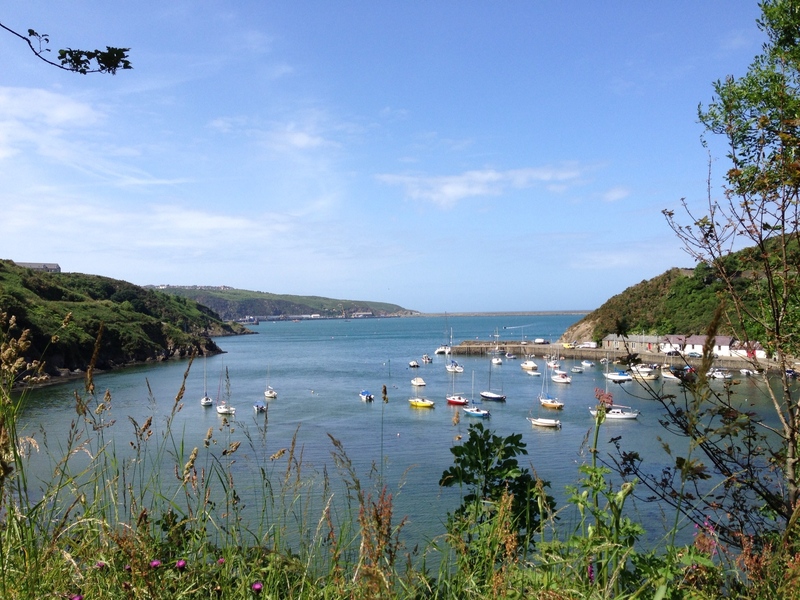 Some of the towns and villages around this part of Wales have Irish rather than Welsh names, a testament to a chequered history with groups from Ireland settling in the area. I made it to Newport and stopped for a pint of Thwaite’s Wainwright Ale, a very pleasant beverage. I raised a toast to the sunshine, which was warming me up both physically and mentally. With all this stopping for breaks today was going to be a long one, but it was just so nice to have better weather. Next up the road took me over the hills to and through Fishguard, where I didn’t stop figuring I should get some miles done. 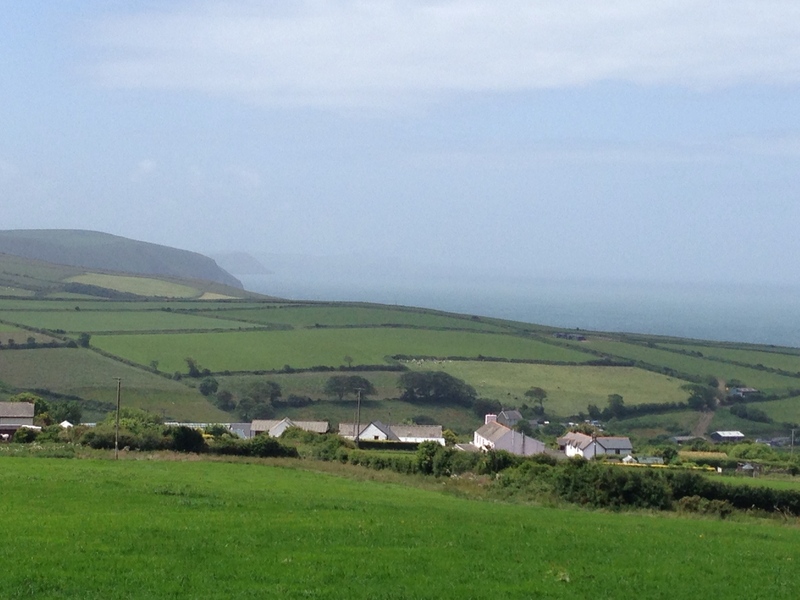 Saying that one of the hills up out of Fishguard nearly forced me to stop and push it was so steep, but I made it up having to stand on the pedals for the last bit. 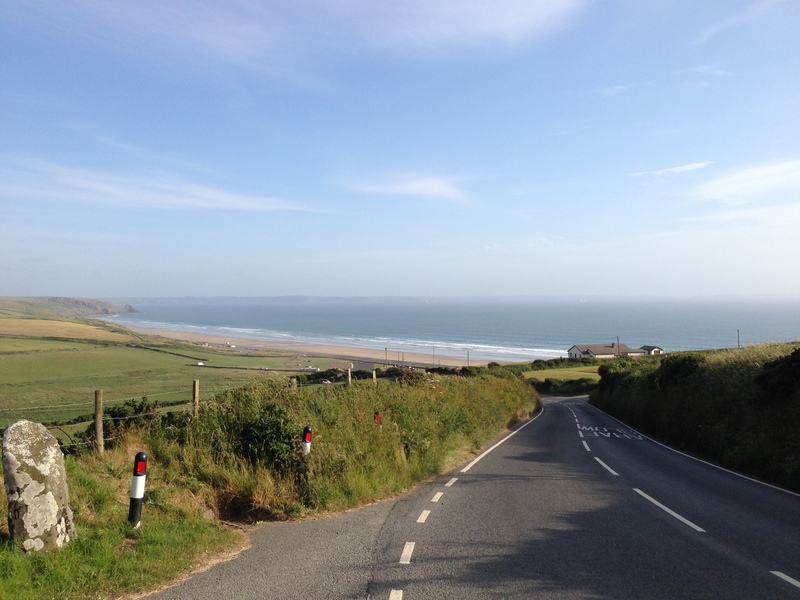 I took the main road for a bit, before turning off at Mathry and heading to Abercastle through more lovely countryside. I was back closer to the coast, but as a result the hills were getting more frequent again, and the road insisted on exploring each nook and cranny. 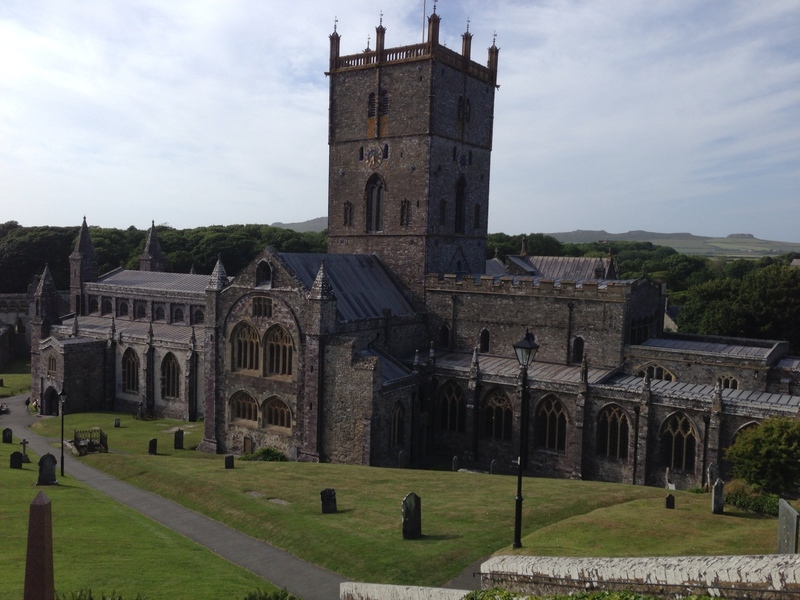 Undeterred I pedalled on to St. David’s, Britain’s smallest city, arriving on aching legs at about 17.00 after a long stretch during which I passed several tourers going the other way. I also spotted a couple of Red Kites, my first of the tour, and easy to identify because of their forked tales. 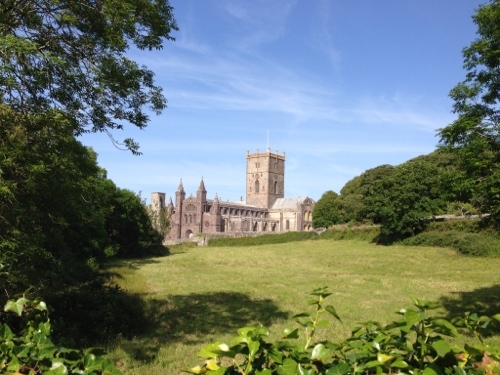 I had a look around St. David’s Cathedral, with the ruined Bishop’s Palace just next door. It’s a really peaceful cathedral, and interesting to look around, there having been a Christian site here since around 500AD. The treasure room in the cathedral has a few interesting artefacts, including several ornate and golden ends to bishop’s staffs – the shepherd’s crook shape, and beautiful chalices used for serving communion. After walking around the quiet cathedral, in a contemplative state, I left a donation and lit one of their votive candles to remember Lu by. I’m not particularly religious, and neither was Lu, but it just seemed like the right thing to do. 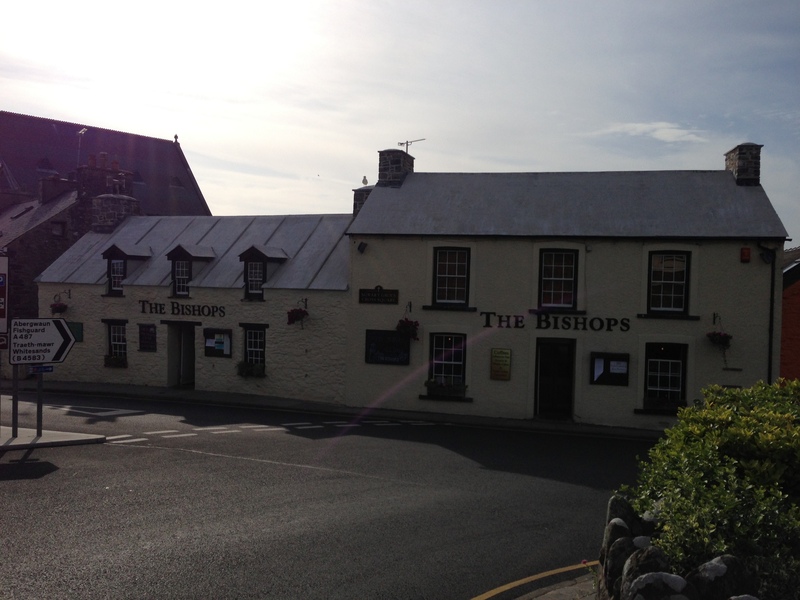 I stopped at the Bishop’s Inn on the way out of St. David’s, for some physical sustenance post spiritual nourishment. It was about 18.00 so the excellent fish pie was well timed. It really was a good fish pie too, with salmon, white fish, mussels, prawns and clams. The chips and a pint of ale weren’t bad either. At this point I turned East and South East, so the wind was finally mostly behind me, a big relief after it having been in my face for several days. I passed through more lovely countryside as afternoon turned into evening, and paused at a few beaches to admire the view. 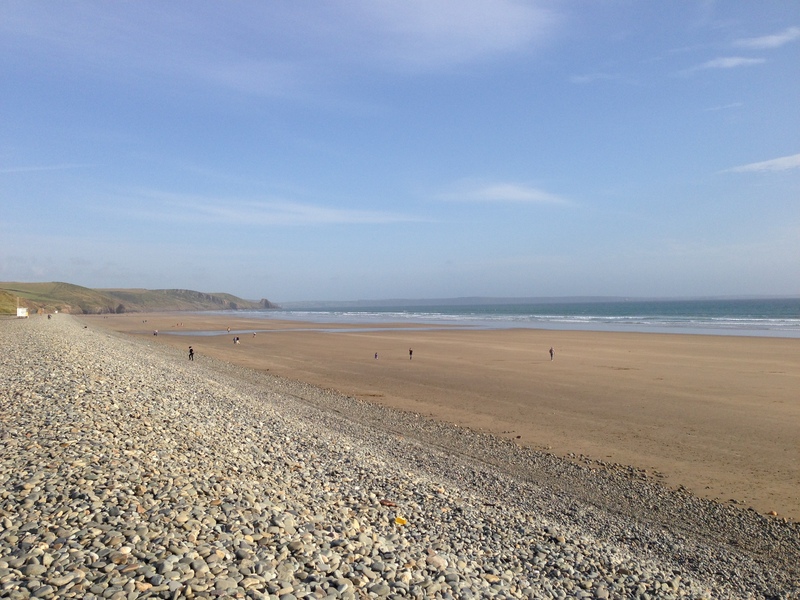 Newgale beach was especially nice, and there were several kite surfers out enjoying the conditions. 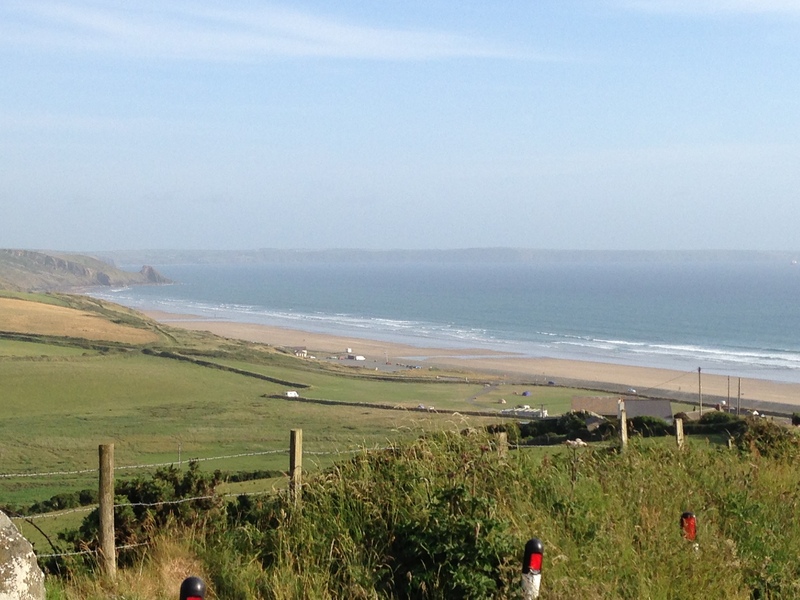 From Newgale I took the minor road around St. 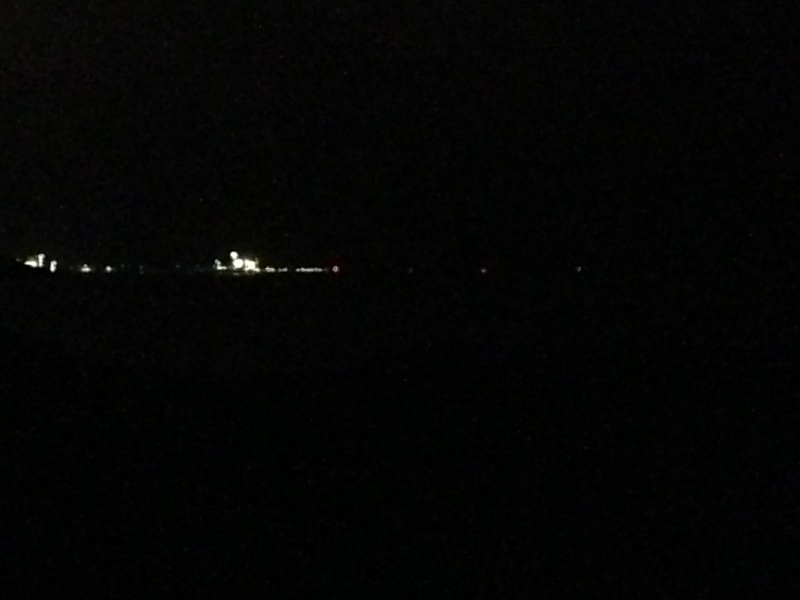 Brides Bay, passing through Norton Haven, Broad Haven and Little Haven. This proved to take quite a while as again the road dipped and twisted down into every cove, and there were a lot of coves. I reckoned my legs must be getting really fit by now, they really ached to prove it. 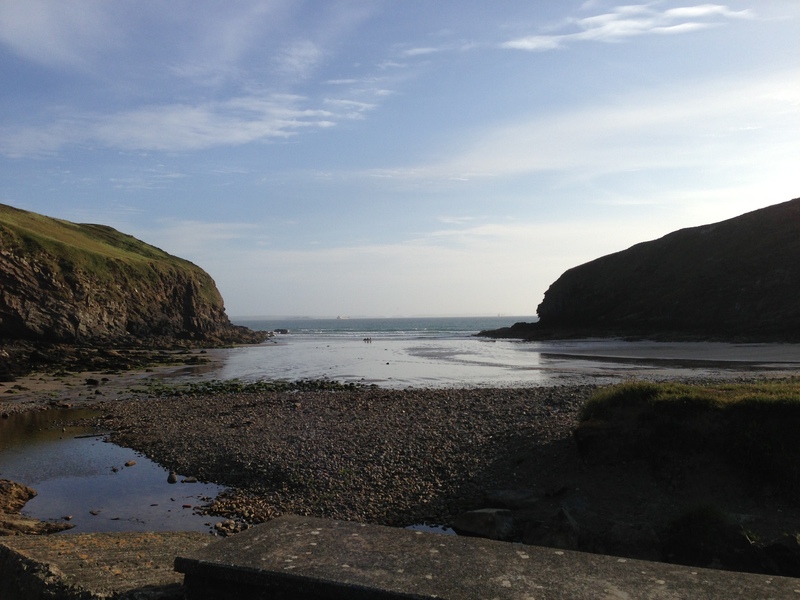 Via a roundabout route I rode down to Marloes, where apparently I used to eat sand as a toddler. I used to drop my half eaten and rather soggy biscuit into the sand, then eat it. I reckon it made them more crunchy. I can’t actually remember where the above photo was taken, I think it was one of the Haven’s, but can’t recall which one. Anyone know? Something stingy flew into my cycling helmet near St. Ishmael’s, and either stung or bit my forehead. It was a bit of a shock and I swerved around the road, desperately trying to get my helmet off in a hurry to extricate the wee beastie. It could have been nasty had there been traffic on the road, but luckily it was a quiet evening. By the time I’d stopped and whipped off my helmet it had made its escape, so I never found out what it was, but I rode helmet-less for a bit after that. 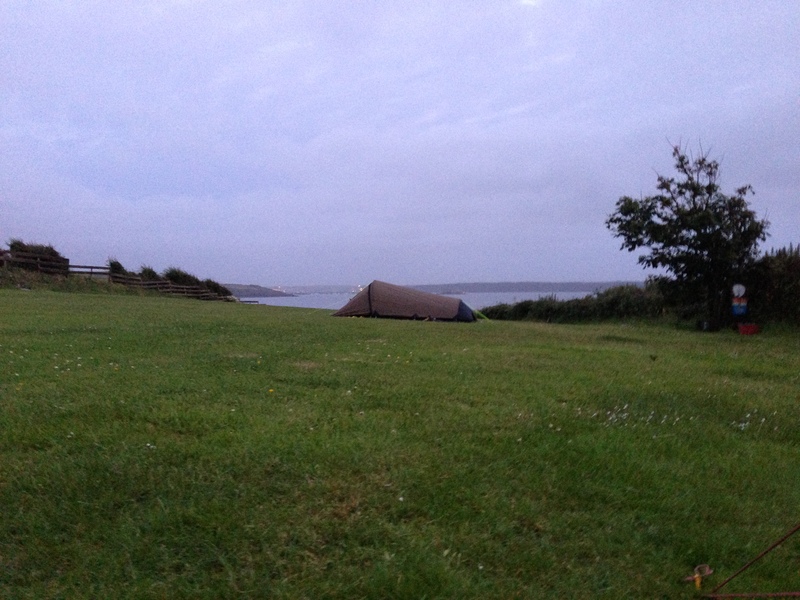 Post more ups and downs I made it across to Herbrandston, and the campsite I was aiming for at Sandy Haven, right on the shores of the Milford Haven waterway. The owners weren’t there but had delegated control to a couple who have a permanent caravan on site, spending more time there than at home by the sounds of it. They were very pleasant, inviting me in for a cup of tea and supplying a key to the shower block. I hadn’t arrived until about 21.00, so another long day with the hills making it slow going, although I had taken a lot of breaks. I’d covered about 72 miles, which was fine considering the longer legs I’d been putting in, and I felt a lot better than I had done yesterday. After a phone call to my parents, and a wash, I retreated to my tent as it got dark, with the wind starting to make it quite chilly now the sun was gone. I was going to try for an early start tomorrow, and needed to visit a bike shop to get some new front brake pads, my current ones having just about worn out. I’m happy to report my PowerMonkey device was charging well in the sunshine; I was really hoping the good weather would stick around for a bit, but suspected a storm might be brewing. I nodded off with the wind blowing my tent about, and my legs aching not insignificantly despite trying to stretch them off. Roll on tomorrow. Was that rain I heard?! 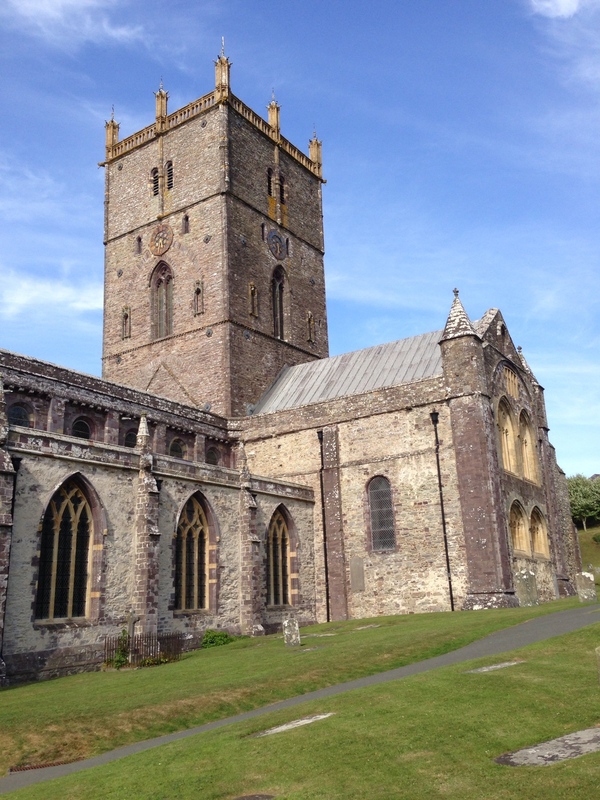 This entry was posted in Bike around Britain 2013 and tagged adventure, bicycle, bike, Bike around Britain, countryside, cycle, cycle touring, cycling, expedition, Milford Haven, outdoors, photos, St David's on September 2, 2013 by SelfPropelled. James, I’ve read and enjoyed less entertaining books than your blog account. It’s better than ‘Round Ireland with Fridge’ and that was published. I hope your ‘hit figures’ are as high as they should be. Thanks Will, appreciate the feedback! Hit figures seem to vary from day to day quite a bit, but got quite a few regular readers which is nice. Once I’ve finished writing up the blog I’ll think about a book. Your bacon and black pudding pies sound most excellent by the way. I miss the food from up North!